iMovie is an official Mac video editing software developed by Apple company. With this professional video editing application, users can edit the video clips, pictures and add titles, subtitles, musics, effects to make their videos or photos more funny and beautiful. Even though it's sold bundled with the Mac computer, it still can't handle with the iTunes DRM-ed videos for the strict DRM protection. So if you are trying to edit your iTunes purchased or rented DRM movies with iMovie, I'm afraid you have to turn to the third party software. To Mac users, I think the NoteBurner M4V Converter Plus for Mac is the best choice to crack the iTunes DRM protection on Mac OS. NoteBurner M4V Converter Plus for Mac is a recognized DRM removal tool for Mac on the market. It gains lots of positive reviews from many famouse magzine and review website, like wired how to, Lifehacker, Macupdate and so on. Its working algorithm is easy and compeletely legal if you use it for personal amusement. So why not learn more about this outstanding application now and use it for removing the annoying iTunes DRM? 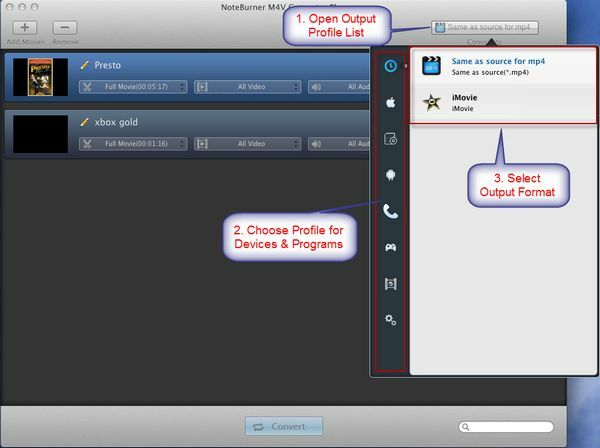 What can NoteBurner M4V Converter Plus for Mac do for you? More than you see from its name, NoteBurner M4V Converter Plus for Mac can do a lot of amazing work for you. It can bypass the DRM protection from both iTunes purchased and rented movies/tv shows easily, and keep the original HD quality 100%. What's more, it convert DRM-ed M4V videos to plain video formats including MP4, MOV, WMV, AVI, 3GP, FLV and so on. Then you can watch iTunes movies anywhere you want, even if you need to edit the movie with iMovie or other video editing software. Step-by-Step Guide on How to Convert DRM-ed iTunes M4V Videos to iMovie? 1. Download NoteBurner M4V Converter Plus for Mac. Install M4V Converter Plus for Mac on your Mac OS. All NoteBurner products are compatible with the lastest Mac OS 10.9 Maverricks. 2. Add M4V movies to iTunes M4V to DRM iTunes Video converter on Mac. Just click the add button and choose movies from iTunes library. 3. Select output profile settings. To convert iTunes M4V for editing in iMovie, you need click the format drop-down list and choose "Same as Source for mp4" or "Same as source for MOV" option. 4. Start removing iTunes DRM on Mac and convert iTunes video to iMovie by clicking the convert button. And then the program will start to remove DRM from iTunes M4V movies and convert them to MP4 format with high video quality. After the conversion finished, you can edit your M4V movies with iMovie smoothly. What's next? 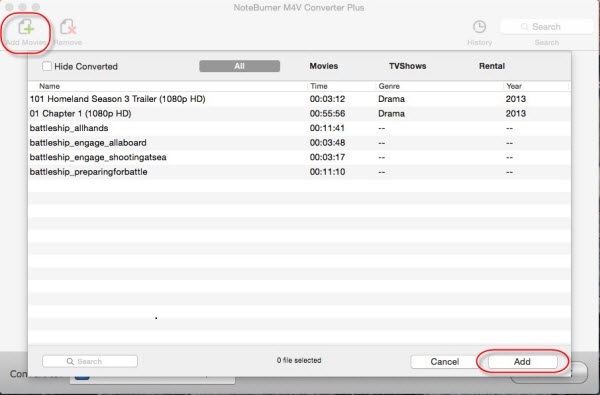 Download NoteBurner iTunes movie to iMovie Converter now!